Val-Clean is a non-abrasive cleaner specifically designed for the hygienic cleaning and maintenance of Valplast appliances. Val-Clean does not contain any abrasives and will not damage your Valplast Flexible Partial. Val-Clean is supplied in boxes of 12 sachets, each sachet will make four week’s supply of solution. 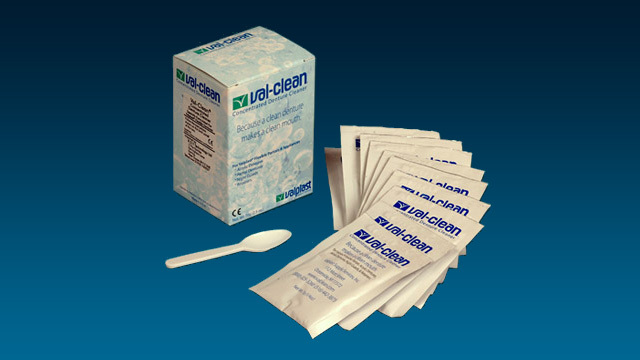 A measuring spoon is included with each box, one spoonful of Valclean is mixed with approximately 7ozs (250ml) of warm water – this solution will last for 7 – 10 days before needing to be replaced. ValClean is designed specifically for cleaning Valplast dentures. A daily 15 minute soaking has proven to be effective in maintaining the appearance and cleanliness of Valplast. Overnight soaking of Valplast in ValClean solution will not harm the appliance. Click here to purchase Val-Clean Concentrated Denture Cleaner from our denture products shop.